Ian McKellen dropped fans a line on his Facebook page today – letting us know that he and Patrick Stewart will be appearing on Charlie Rose tonight, to discuss their two Broadway plays Waiting for Godot and No Man’s Land. The show will air at 11 P.M. eastern time on WNET Channel 13 in New York. For other areas, check your local listings. 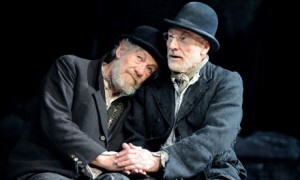 Both Waiting for Godot and No Man’s Land opened this past Sunday at Cort Theatre in New York City to critical acclaim. Visit http://www.twoplaysinrep.com for tickets and additional information. You can get a sneak peek of Waiting for Godot below, in HD. This fall, four great actors return to Broadway in two great plays, performed in repertory. IAN McKELLEN, PATRICK STEWART, BILLY CRUDUP and SHULER HENSLEY star in Harold Pinter’s comedy NO MAN’S LAND and Samuel Beckett’s classic WAITING FOR GODOT. Sean Mathias’ productions present a startling new look at these two theatrical masterpieces. In NO MAN’S LAND, two elderly writers, having met in a London pub, continue drinking and talking into the night. All might be well, until the return home of two younger men. Their relationships are exposed, with menace and hilarity, in one of Pinter’s most entertaining plays. In WAITING FOR GODOT, two wanderers wait by a lonely tree, to meet up with Mr. Godot, who they hope will change their lives for the better. Instead, two eccentric travelers arrive, one man on the end of the other’s rope. The results are both funny and dangerous. Beckett and Pinter have fascinated and delighted theatergoers worldwide for decades. Don’t miss this limited engagement of four great actors in eight great parts in two of the theater’s greatest plays.